Where on earth did you get such a ridiculous notion? I wouldn’t be calling the Chida, Ben Ish Chai, Tzitz Eliezer (where there is a long piece on this which I read 15 years ago) “ridiculous”. There is a contradiction between Bavli and Yerushalmi and there are many who hold that it’s only at the age of 20 that the “full force” of punishment is applicable to a youth. Yes, they are responsible for Mitzvos at 13 and 12, but I am talking about punishment. But even if such opinions do exist, they are surely very much isolated, and are not to be cited as if they were standard. As far as I know the halacha is clear beyond any dispute or discussion, that a 13-year-old is fully subject to punishment by beis din. For you to come along and call that standard mainstream view “disingenuous” is either pure amhoratzus, or itself disingenuous. A)It is clear that at 13 one is a “bar onshin”, you might be alluding to an aggadic teaching in the Talmud that only at 20 (not 21)is one punished biyedie shamayim. but why muddle the waters with a total non sequitur like this? Is that the problem with the testimony?? Really amazing why you would focus on this , when is is so tangential to what is being discussed?? The testimony of Feldman was a pilpul. The issue of a 13 year old being considered a minor in respect of crime in Judaism is a nonsense which makes absolutely no difference. He threw it in to try and imply that someone aged 14 would have a different halocho if they were violated. That in of itself is completely irrelevant and only caused a Chilul Hashem. What he should have known is the law of דינא דמלכותא and he does. Accordingly, as a so called educator he has a חיוב to know that Bar Mitzvah is irrelevant in this case. As his testimony was a pilpul, I should remind you that as you don’t bring Korbanos till you are 20 even though you are a Bar Mitzvah, I recall the Tzitz Eliezer (yes it was 15 years ago) asking the question whether someone could be Motzi the Kohol if they were under 20 as Tefilla is BeMokom Korban and someone who does Teshuva brings a Korbon. He was ill advised to go down that path. It was completely irrelevant. You are a rodef whether you go after a 14 year old boy or a 12 year old boy. It’s more than a Medrash. It was my disgust for his use of Torah and appearance as a complete ignoramus of the laws of the land which prompted me to throw that in. Now, Yossi and Berel, if you incite me anymore, I will quote a Tshuva from the Tzemach Tzedek which perhaps he should have brought to the table in his defence. I don’t think you know it, but if you do, you’d not want that brought to a Royal Commission any more than the specious comment about someone being mechuyav b’mitzvos at 12 or 13. Gott in Himmel. Anyway, after today’s unfortunate tape recording, you can see where his misguided pilpulim have led him. Expect his resignation from the NSW Rabbinic Board in the next week. A shande and a charpe. And no, I don’t go to that site. Someone sent me a link and it also destroyed my day. 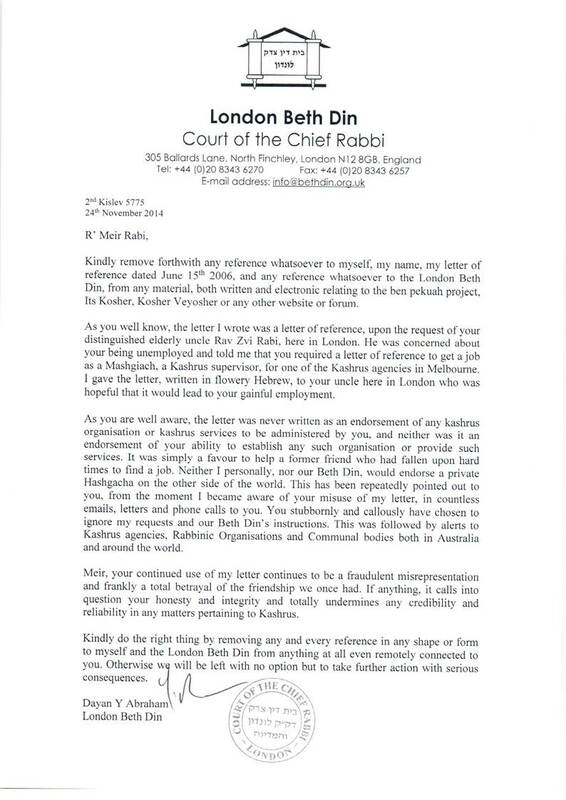 There is a lot to be said about Chabad and their appointing to rabbinical positions individuals with very little time of study in kolel and in the “school of life”. A rov cannot be someone who took a short “semicha” course.It has to be someone who has done intensive study for years.Now is not the place and time to discuss it. I don’t know the people involved here so they may actually be people who have studied for years, I”m just making a general comment.I hope that this saga will end with healing for all parties involved. btw, what teshuva from the Tzemach Tzedek were u alluding to? I’m not sure if you’re familiar with the Sydney community, but there are only a handful of people who have even Smicha, so it’s a case of all hands on-board. The results are predictable and embarrassing. That is unmitigated rubbish. Where are you coming up with this stuff? Really, the amhoratzus you’re showing on this subject is astounding. I might need to acquaint you with some sources. I will find the Tzitz Eliezer, which if I recall correctly discussed it in a Hadran Pilpul that I read. Have you read R’ Akiva Eiger on this? No, I haven’t seen R Akiva Eger, or the Tzitz Eliezer, but I can state with confidence that anyone who says a person doesn’t bring a korban until he is 20 is wrong. That is simply not the halacha. The chiyuv to bring korbanos starts at the same age as all chiyuvim, at bar mitzvah. Really. Are you claiming that חיוב כרת starts at 13 and it is unrelated to a חטאת? I do know about this tesuvah of the Tzemach Tzedek, and since you know of it too, how do you not take it on board? Do you really have the CHUTZPAH to suggest that the Tzemach Tzedek was wrong?! Firstly that Teshuvah related to a value judgement based on an assessment of the social proclivities of a person. Now you claiming chutzpah because I mentioned it, is a bit of a straw man and rather inflammatory. Knowing you, I won’t get offended by your rather vicious language. Let me remind you that I don’t subscribe to the view that any Posek or Rebbe is infallible (and that is a Torah view, as I’m sure you acknowledge even though you may not subscribe to that view). Your mileage may differ, and no doubt does. Good luck to you. We are in the middle of the biggest Chillul Hashem Australian Jewry has ever experience with Rabbi Glick on the stand right now. Have a look at the AJN. We have had Yossi Feldman put up as a leader and who has made a disgrace of orthodoxy. Now I read comments like ” Do you really have the CHUTZPAH” and “That is unmitigated rubbish. Where are you coming up with this stuff? Really, the amhoratzus you’re showing on this subject is astounding.” A bit of GOYISH derech eretz would be welcome. If you disagree with someone then write it politely and objectively. When someone suggests that he knows better than the Tzemach Tzedek, that is an incredible chutzpah. And when someone dismisses the plain halacha as “disingenuous”, based on some obscure pilpul that he once read, that is amhoratzus. I’d suggest that nobody has said that they know better than the Tzemach Tzedek. What has been said is that the skills of a Rav in determining whether someone has been violated need to be combined with the knowledge we now have and which was not available then. A Shikul Hadaas in this case involved some verifiably researched knowledge that was not there before. Did the Rashab go to Sigmund Freud for Sheva Mitzvos B’Nei Noach? Oh, and after I’ve looked it up, you’ll see that it’s not obscure. The Tzitz Eliezer was never obscure in his Toros and Rav Akiva Eiger was universally considered a giant. Isaac i am not sure if chaim new is your friend. But there could be conflict of interest by the task force. While they are making all the right noises about victims not being scared to come forward and training etc there no mention by the task force of how communities should respond if their members come forward and call for action by the commuity members that community starts to vilify that person. If I were molested at Yeshivah and went to the Task Force asking what I should do, surely there is a conflict of interest if I am speaking to the wife of one of the Yeshivah Executive. Steven you are inventing and concocting. Firstly there is a phone line. Although it is possible that someone could go to an individual and assuming that person was married to a board member, you are alleging that they would conspire to hide or advise the person not to go to the police? Do me a favour. If there were ten members of that board (I don’t know how many actually are) and one of their husband’s was on the board of Maccabi (or whatever organisation) it is possible that they would be approached by someone with a complaint. Are you seriousy suggesting that these ladies would seek to protect the institutions their husbands were involved with? Just look at COSA yesterday. They immediately called for and got Yossi Feldman’s resignation. I think what is being alleged here is scurrilous and without evidence, and frankly I won’t allow any further discussion on that line as it could be deemed defamatory. I would find it offensive in the extreme if I was in that situation. Lubavitch has taken over almost every available pulpit in Australia. A briliant idea with one problem, that many members of the rcv didn’t study more than one year in a kollel, spending most of their time, learning about things that have nothing to do with the problems they will face in their community. They spend hours on “problems” like what is the din when you will find a needle in a cow’s stomach, do you have to suspect that the needle on the cow’s her way from the cow’s mouth to her stomach punctured certain organs, and don’t spend any time learning about problems in the community. I think Smicha (for practicing pulpit Rabbis and similar) needs to be revised along the line of the YU Smicha. I have posted on this in the past. Even with today’s standards, that rabbi wouldn’t get much of a sentence, if any at all. We’re talking a minor act with one person, where he had an excuse that his kehilla felt was plausible. So it’s obvious that when a true posek paskens, he has sayyata dishmaya. There is obviously nothing to be embarrassed of. However, most cases we hear of today are much different, so from a practical point, it doesn’t have much relevance. The teshuva is on what was being asked. Of course there may have dozens of people which no-one new about. That would have obviously been a different answer. As an aside, even knowing of an illness, this was a better response than the only option.rather than throw him out to have him move to the next kehilla, keep him there where he could be watched, and he knew he was being watched. Unfortunately, most yeshivos didn’t do this. Next Next post: Is it Kosher? Does that also mean is it moral?